We are a leading Manufacturer of virgin human hair, virgin remy hair, temple hair wavy, machine weft remy curly hair, peruvian human hair and straight wavy deep curly hair from New Delhi, India. We are highly engaged in providing Virgin Human Hair.We obligated to meet the quality standards as per the latest trend and fashion. 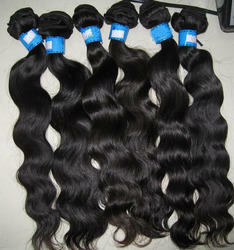 We are the leading Manufacturers,Traders and Suppliers of Virgin Remy Hair. 100% human hair (texture wavy), you can dye it, press it,long life usable. Understanding the preferences of the customers, we manufacture supply, retail & export an ecstatic gamut of Machine Weft Remy Curly Hair. The hair is strong silky and smooth. The range can be availed in various lengths depending on the specifications made by the clients. Double Drawn Hair has an aesthetic appearance and is packed using the premium quality material. 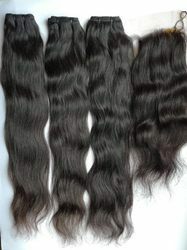 We are one of the leading manufacturers and suppliers of the premium quality of Peruvian Human Hair. Due to its natural appearance, color, shine, and bounce, the rendered Peruvian human hair is highly demanded. 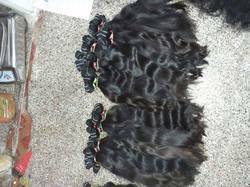 For ensuring high standards of quality, the rendered Peruvian human hair is checked on various quality assurance procedures. Since the inception of our company, we manufacture the premium quality of ALL TYPE WAVE. Used in fashion and film industries, the rendered body wave hair wigs are known for their lightweight, smooth texture, and tangle-free nature. Available with us in black and brown color, the rendered body wave hair WAVY are highly demanded. Remy wavy hairthese are 100% virgin super fine quality of silky wavy indian hair which are appreciated and demanded for their soft texture and low maintenance. Wavy hair thus has shiny, smooth and silky appearance. They can be curled for a different style as per the requirements of variegated clients. Remy is in top nowadays for its quality, we offer you the best quality washed packed and ready to use products with smooth texture and shiny look. Manufacturer of a wide range of products which include indian remy straight hair, indian wavy hair, temple remy unprocessed indian hair, virgin indian hair, indian colored hair and remy indian hair. 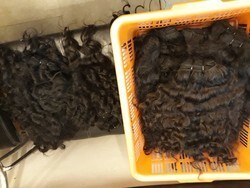 natural waves of indian hair is also a kind of hair extensions which is liked for its smoothness and softness and textures for the look.Came into existence in 2010, Blessing Indian Remy Hair Exports Private Ltd.(BIR Hair Export) is a eminent manufacturer, supplier of a wide array of Curly and Straight Hair. Our wide range of products comprises of Weft Straight Hair, Weft Body Wave Hair and Machine Weft Curly Hair. All these products are verified by our professional before delivering to the customers. WAVY HAIR is common for its look among the girls and fashion industries, this kind of wavy hair is permanently wavy, usage is for life time, after each wash it will come back to same texture and shine will be along with hair life. Came into existence in 2010, Blessing Indian Remy Hair Exports Private Ltd.(BIR Hair Export) is a eminent manufacturer, supplier of a wide array of Curly and Straight Hair. hair extensions in this category is on the side of virgin hair which need to be used with none-chemical shampoo and conditioner. Our wide range of products comprises of Weft Straight Hair, Weft Body Wave Hair and Machine Weft Curly Hair. All these products are verified by our professional before delivering to the customers. 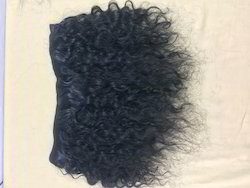 We are the supplier of the¿¿Deep Curly Hair to our clients. 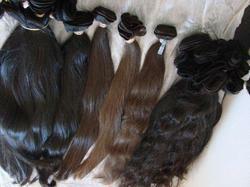 As a quality focused name, we manufacture and supply the premium quality of Mongolian Human Hair. Due to its rich attributes such as hair strength, tangle-free nature, and smooth texture, the rendered Mongolian human hair is highly demanded. Besides this, the rendered Mongolian human hair is rendered by us in black and brown color.